Where is Joseph in the Birth of Christ? As we celebrate the birth of Christ tomorrow, people all over the world will focus on Jesus, who put on human skin and stepped into our world. Many will remember Mary, who through her obedience became the Mother of God and essentially the first Christian. 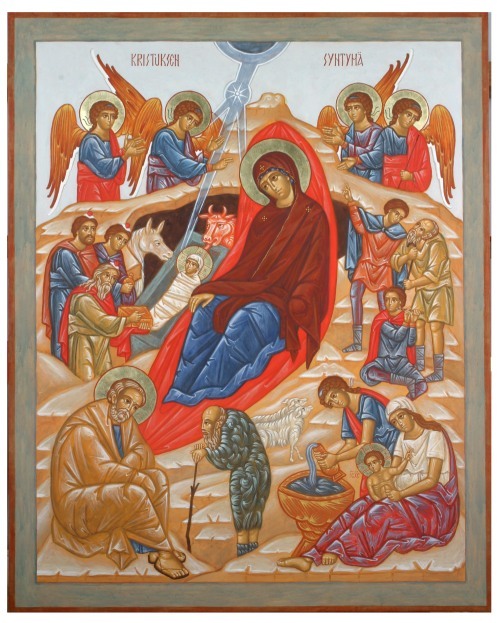 The Orthodox icon of the Nativity, seen above, is no exception. Mary and Jesus are front and center, flanked by angels, animals, wise men, and shepherds. Yet Joseph plays a part in the story, too. In the icon, Joseph is not at his wife and new child’s side, fawning over his baby as we would expect him to be. Instead, he sits below his wife, dejected and being approached by a small, old man. That man is the devil, and is trying to convince Joseph that the child indeed cannot be God himself. If he were, why was he born as a human, in a mere cave? Joseph obviously struggles with the idea of the incarnation, with the movements and workings of God, with doubt and questions. You might want to grab Joseph by the shoulders and shake some sense into him. The Son of God has come into the world, and you’re over here despairing? Wake up! See your son, who is God Himself, the Messiah! Yet I must admit I’ve been where Joseph is. Perhaps I continue to be there, my faith like a sore hangnail that I can’t rip away, but that never seems to heal. How often I remain in the arms of doubt and cynicism. Especially this year, after the horrific Sandy Hook school shooting, and in the midst of my husband’s grandfather battling cancer again, and in the unrest in Egypt and Syria and elsewhere, and in those whisperings that come into my heart each Christmas reminding me of a time when the family I grew up with was intact. Can I really proclaim God when there is so much sadness in the world? I want to say yes. I want to close my eyes and know nothing but light, and Him, and love. I want to think on every good thing that remains in the world, and in my life, and know it came from Him. I don’t know how I can do this after being so hunched over and unsettled like Joseph for so long. But I want to try. Like Joseph, my mind can’t comprehend God, but my soul struggles toward a belief in Him. With my shaking voice, I want to come to Him and announce Yes, I adore you, Christ, my Lord. How is He contained in a womb, whom nothing can contain? be held in the arms of His Mother? as He knows and wishes. for our sakes has become that which He was not. He has shared in our substance. Christ has undergone a twofold birth. Forgive if I diverge a bit from your topic, but Joseph is not treated fairly in this picture. We should think of what this means. He could have exposed her to shame, but instead would privately put her away. What would be the result? People knew they were engaged, and suddenly she was alone, expecting a child. Joseph would therefore have taken the blame upon himself. That’s the kind of person he was. So the Angel comes and explains to him what is going on. He accepts the explanation without wavering in faith. He could have intruded his own human desires. He could have said, “No way I’m doing it. I want my own son. What will people say? They’ll think I got her pregnant before marriage and will say all sorts of evil things about me.” But he accepted this for the sake of the Lord’s cause. Now think a bit. What if the Lord had waited until they were married? Wouldn’t that have been better, since then there would be no appearance of evil or shame upon them? But the Lord chose for her to be pregnant before the marriage in order to make it clear that this child was not from flesh, but from the Holy Spirit. Would everyone understand that? No, the people who wanted to think evil would still think evil. But the righteous would understand. Joseph accepted the appearance of evil, because he discerned the Lord’s purpose, and would cooperate with it. He would bear the shame so that the Lord’s plan could go forward. Mary was of a similar character. They were normal humble people, yet possessing remarkable faith and the spirit of sacrifice. Joseph was not the least bit behind Mary in the manifestation of faith and obedience. This is why the Lord chose them. So may the Lord work with us in our sphere, if we will exercise the same faith. Thought it is not a Scriptural document, the Orthodox Church makes use of many historical documents about the church, because the church existed before the canon existed. So we do consult a variety of documents that existed pre-canon (I know we pull from Ignatius from Antioch’s writings and letters a lot) to see what the beliefs and practices of the early church were. I did not write this to put Joseph down or to minimize his obedience to God. He’s most definitely a saint in the OC. I wrote it to show his humanness and his struggles even as he was playing a major part in God’s story. I wanted to connect (and hopefully help my readers connect) to the idea that we can be Christians and have some doubt and wrestling, and that’s okay. You have seen that theme a lot on this blog, I know. It’s how I approach my faith – at least right now.